A wonderful short trail that is accessible year round and very flat. It loops from Sentinel Drive parking lot and across from Yosemite Falls.The best time for waterfalls is in the early spring, but this area of the park is equally beautiful in fall when the meadow turns a golden yellow and the black oaks and elms start losing their brightly colored leaves. Cook’s Meadow is also accessible from shuttle stop #11 (near Sentinel Bridge) or shuttle stop #6 (Lower Yosemite Fall Trailhead) This short, easy walk offers stunning views of Yosemite Falls, Half Dome, Glacier Point, and Sentinel Rock. 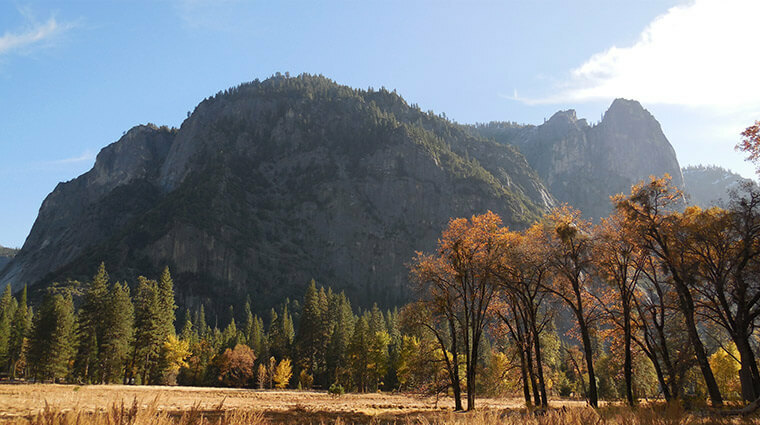 From the visitor center, walk west along the bicycle path toward Lower Yosemite Fall. At shuttle stop #6, cross the street and follow the bike path, bearing left as the path forks. At Sentinel Bridge parking area (shuttle stop #11), walk out onto the bridge to enjoy a classic view of Half Dome before returning to the parking area. Follow the boardwalk back across the meadow, cross the two streets, and turn right to return to the visitor center. You can just as easily walk this loop in reverse; a self-guiding brochure is available in front of the visitor center describing the trail in a clockwise direction.